So I've finally discovered the joys of making gifs! Yeah, yeah, I know I'm late to the party, but I think for a post like this, mere screencaps won't do it justice. So please enjoy! Warning: this will be GIF heavy, so it might take a while to load for slow internet connections! Of course, this comedian gets the due smacks on his wigged head from his team mates, and Arashi's reaction is one of polite amusement. Domyouji himself seems quite taken with the creative license this guy has exercised to help promote their new game show. But this guy isn't finished busting his moves! Does anyone remember. oh, just a fantastically AWESOME little Arashi number called "Truth?" Apparently, he likes to practice MatsuJun's position, so MatsuJun kindly let him borrow his bandmates for a little rehearsal of the opening of "Truth." Arashi is impressed with how well he did. They show the PV of Truth for comparison purposes; looks like this comedian guy's been doing his homework well! A++, man! Sakurai-sensei looks particularly impressed; perhaps it's because he remembers how he and Aiba were the two culprits who kept getting the steps wrong and caused everyone to have to stay late during the filming of that PV? Next, let's relive that hilarious episode of VS Arashi (2013.07.18) with fellow Johnny's Kazama Shunsuke as the Plus One Guest. 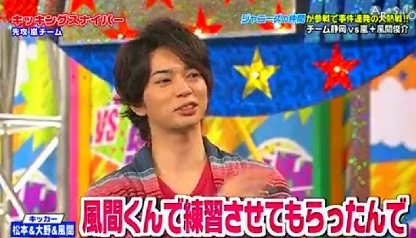 Now, girls, who doesn't love it when another Johnny's guests on any Arashi variety show? And Kazama-kun is about as entertaining as they come, with his floppy hair and good-natured resignation to being endlessly teased by his sempais (though the Kaze Trio are really more like his equals) about his inability to "dance." Weird for a Johnny's, right? Well, to prove them wrong and defend his own honor as a member of this elite agency of ikemen, Kazama-kun jumps on that Kicking Sniper conveyor belt and (attempts to) rock Arashi's debut song, A.Ra.Shi. Enjoy. Yeah, so first, Riida and DoS Jun kick their giant rubber balls at the rocking Kazama, who yells out, "Aren't you being strange?!" before being swallowed up by the curtains. Love Jun's self-satisfied smirk as he passes by the camera there. And Yama pair can barely keep their teeth from showing. Sakurai's kneeling on the ground with laughter. A few minutes later, as the announcer is asking them how they feel about the Kicking Sniper, Jun very coolly declares that he feels confident "because I've just been practicing on Kazama-kun." LOL. I love your bitchy diva attitude, Jun! Aiba is told by the bystanders to go easy on Hatori-san, who is in his 40's. Still, it's hard for our idol to stop laughing at the way his guest utterly fails at doing that little part where he's supposed to slap his knee. Just some bonus Maru, attempting that signature "Troublemaker" sweep while Sho-kun looks on with apparent amusement. Because sometimes, Arashi is just too cool for humans. Their music is so catchy that even robots dance along to it. Presenting... Wild at Heart, featuring some robot and Ohno Satoshi. Yup, the engineers programmed this lifelike robot to dance to Arashi's "Wild at Heart," and Ohno joined in midway through the dance. Afterwards, he remarked that the robot remembered the moves better than he did. Tut tut, Riida... this was only 2013, and "Wild at Heart" was released in 2012... how can your muscle memory be that short? It's so Riida-like to slack off... even when dancing next to a robot. Okay, I'll end the list here. I really want to add the 2013.06.22 episode of AniShi where Himura-san of Banana Man was the guest and he made Arashi dance "Himu-so-sweet" with him as the center at the end... But I sadly don't have that clip, so I can't make a pretty little gif out of it. It is hilarious though, and you should all do yourselves the service of watching both the Himura episodes on AniShi. Here's to more and more moments of physical embarrassment for our boys in the coming months! and this post was just pure win. I remember Taka-san and Nakai-san teasing them no end about their debut dance moves in Utaban. I miss that show sigh. Haha I just read your twitter conversation. Thanks for the shout-out, and the enthusiastic petition to get me to join Twitter. I can get an account, but I honestly don't think I would be tweeting half as much as you or your friends do. I'm so bad with keeping up to date with things... especially when Arashi is super busy like they are now, which is why I like writing flail posts on random throwback moments so much lol. Man, Utaban was SUCH a good platform for Arashi. And Nakai is a genius host. I really wish there was more onscreen SMAP x Arashi interaction (I always watch for it during Kouhaku)... but some things are beyond our power, I guess. Sigh. Oops guilty here haha. For a super lazy fan like me, I totally enjoy to be on twitter to keep updated of their activities and news as well. and of course there are certain blogs that I followed. All of you people never stop to amaze me be it with your random or specific posts about them. How I wish I was involved earlier in this fandom. BTW, I watched the Shiyagare with Kanjani 8 and I found it was so cute when Kanjani 8 got jealous on how perfect Arashi with that choreo. I squealed when our boys demonstrate it. They did it professionally it was cool :) oh I have to watch this again. Our boys are well-loved indeed ❤ I was actually pretty impressed with that guy who danced the truth intro. Lol. I swear he must have practiced for a while. Oh speaking of which, I can't believe I forgot to add that clip of an Indonesian boy dancing to truth (I think it was aired on a Himitsu no Arashi episode back in the early HnA days...)! God THAT was gold.